The Spring term has been very busy. 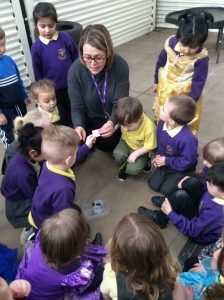 We have welcomed a new member of staff, Miss Sutcliffe, along with several new children. They are all beginning to settle in and make friends. 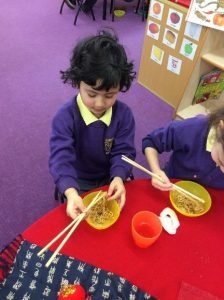 Everyone enjoyed learning about the Chinese New Year and how it is celebrated by the Chinese community. 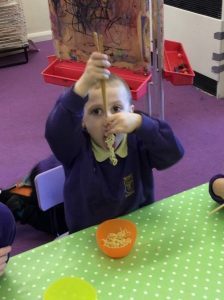 Some children helped to re-enact the traditional story of the animals competing in a swimming race, to decide who should have the year named after them; whilst others helped to make Chinese lanterns and a fantastic dragon model. 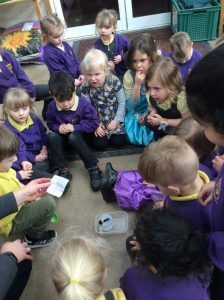 The dragon was used to perform a dance for the children in Reception. 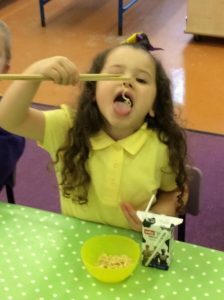 The children enjoyed using chopsticks to eat noodles and prawn crackers at snack time; it definitely wasn’t as easy as it looked. 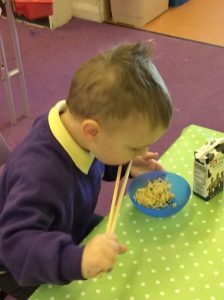 The children have really been enjoying this term’s ‘Once Upon a Time’ theme in Nursery, and our focus story Goldilocks and the Three Bears. 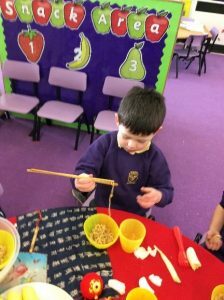 Everyone was shocked to find that somebody had sneaked into the stock cupboard and made a big mess; there was a broken chair and porridge everywhere. 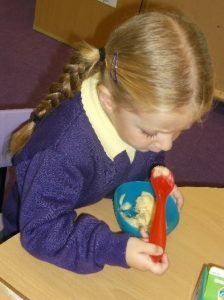 The children worked out that it must have been Goldilocks who smelt the porridge that they were going to eat at snack time. 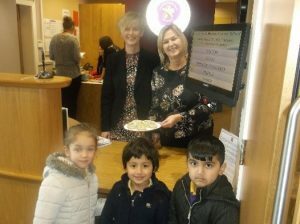 They were very forgiving and made posters to let her know that she was welcome to share their porridge. 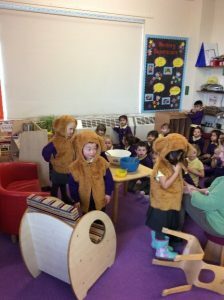 The children had great fun taking turns to act out the Goldilocks story. The ‘Once Upon a Time’ theme will continue, but with greater emphasis on ‘homes’. We’ll be learning about huge castles, tiny cottages and tall towers. If you’re out and about during the half term break, you could look out for these types of homes. This would give your child something exciting to talk about during group discussions. 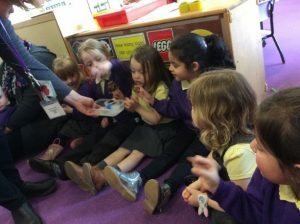 Lots of children have now received their Marshall certificates, with some even achieving Everest; they are well on the way to changing their library books 30 times. 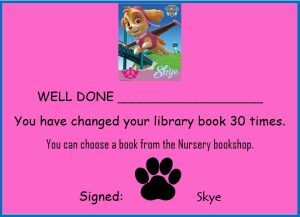 This means that they will achieve a Skye book voucher, which can be exchanged for a book of choice from the school book shop. 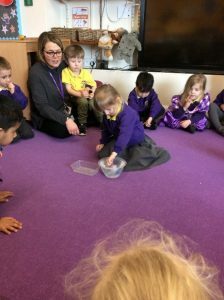 A big thank you to all the parents, grandparents and childminders who joined the Nursery children on Friday for a special ‘Children in Need Stay & Play’ session. 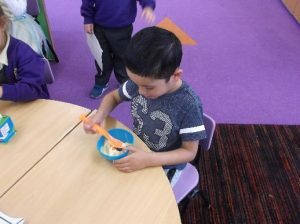 The children took part in a Dough Disco and explained how it builds up the muscles in their hands and arms, helping them to develop their fine motor skills, including writing, drawing and using scissors. through selling bags of playdough. 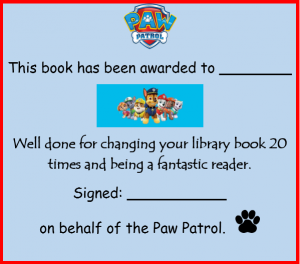 Lots of children are getting close to changing their library books 10 times and receiving their first ‘Paw Patrol’ certificates. Remember to keep bringing yours in. Once you’ve read 30 books, you can choose one to keep from the school bookshop. We hope that you all had a great summer and are feeling refreshed and ready to enjoy all the exciting activities we have planned this year. 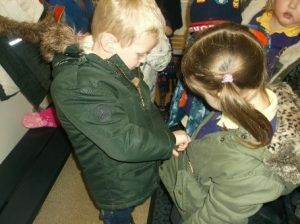 The children are already settling into the Nursery routines and it is lovely to see friendships beginning to develop. 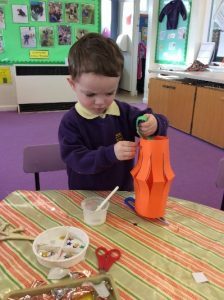 Please could we ask that all children come to Nursery each day wearing appropriate clothing for playing outside, particularly as the weather gets colder (ie: warm coat, mittens, hat and welly boots on rainy days). 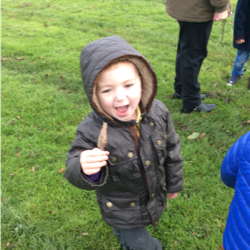 We use the outdoor areas in all types of weather and it is much more fun for your child if they are suitably dressed. 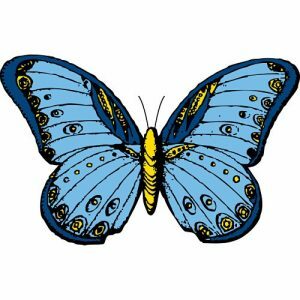 During the first half term the children will be learning about themselves and how special they are in the topic ‘Who Am I?’. 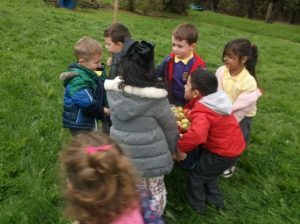 They will be involved in activities that encompass all areas of the curriculum (eg: speaking and listening in small groups, drawing and painting self-portraits, naming body parts, comparing heights, counting fingers and toes, developing self-confidence in using the outdoor equipment and much more). Please could you talk to your child about how they have changed since they were a baby. Encourage them to think about the things that they can do now, that they couldn’t do when they were babies. 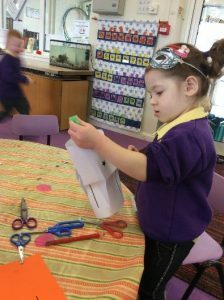 The children are welcome to bring in photos of themselves as babies, to show the class and display on our ‘Families’ display. Calling All Babies! Are there any brave babies out there who wouldn’t mind being bathed in front of the Nursery children and any even braver parents who wouldn’t mind doing the bathing? (Don’t worry, you won’t have to do any talking). If so, please have a word with Ms Rolston. We are now collecting snack money. This can be paid weekly, half termly or termly – whichever is most convenient for you. 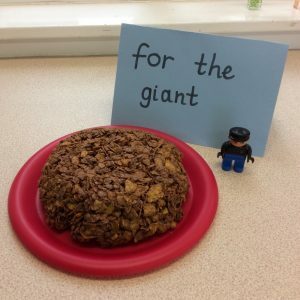 ~ 50p per week ~ £3.50 up to half term break ~ £7.00 up to Christmas holiday This is very much appreciated, as it allows us to supplement snack and provide ingredients for baking. Many thanks. The Spring term has been very busy. 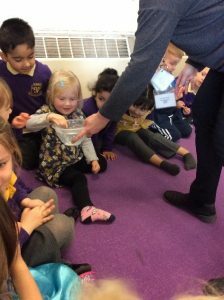 We have welcomed several children to the Nursery and it has been lovely to see how quickly they have all settled, and starting to make new friends. 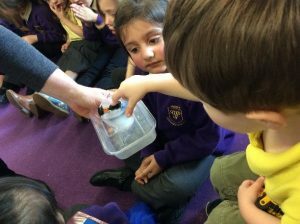 The staff feel very proud of the way in which the other children have looked after their new friends. 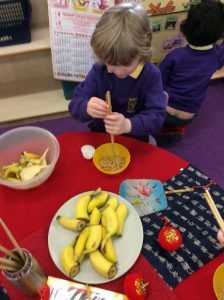 Everyone enjoyed learning about the Chinese New Year and how it is celebrated by the Chinese community. 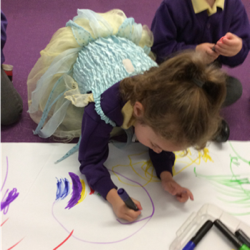 Some children helped to re-enact the traditional story of the animals competing in a swimming race, to decide who should have the year named after them; whilst others helped to create a fantastic dragon model. 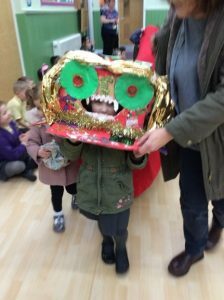 The dragon was used to perform a dance for the Nursery parents and the children in Key Stage 1. 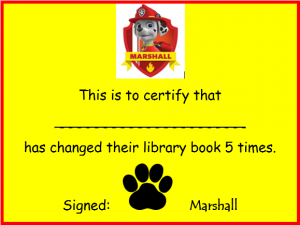 Lots of children have now received their Marshall, Everest and Rocky ‘Paw Patrol’ certificates, and are well on the way to changing their library books 20 times. 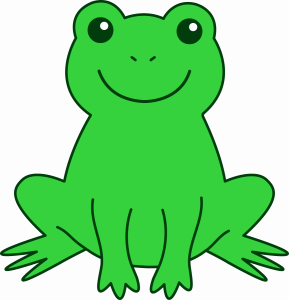 This means that they will achieve their Zuma book voucher, which can be exchanged for a book of their choice from the school book shop. Two elves named Elsie and Elvis have come to live in the Nursery this half term. 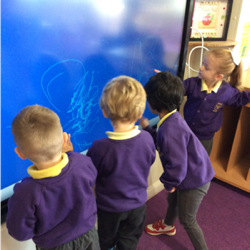 They are encouraging the children to use their collaborative learning muscle, whilst being kind and thoughtful to others. 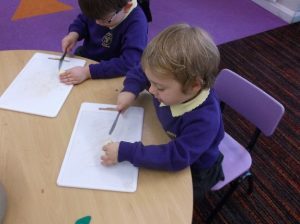 Here are some of the ways that the children have been doing this. 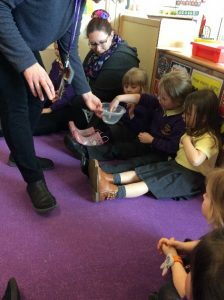 A group of children from the morning class worked together to make buns for the ladies in the office, whilst some of the afternoon children decided to bake a treat for Mr Cooper and Mrs Yates. 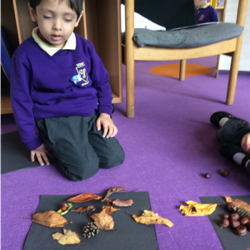 Since returning to Nursery after the half term break, the children have enjoyed exploring the seasonal changes. 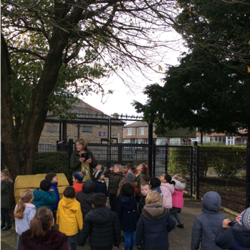 Everyone went outside to find out what had happened to the trees during the half term holiday. Where were the leaves? 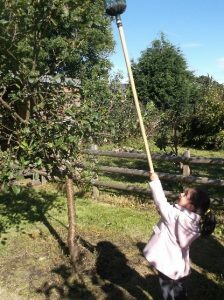 The children decided that they had been blown off the trees by the wind. They found them on the ground. The children looked up through the branches and said that they could see the sky. 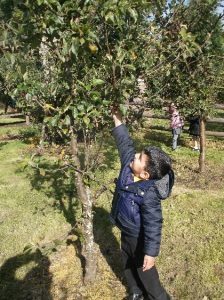 Some of them noticed that one tree still had its leaves and also some berries that looked a bit like tiny tomatoes. 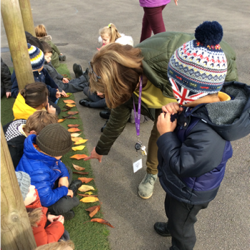 Everyone looked for two special leaves and placed them in a long line, so that we could see their beautiful colours. 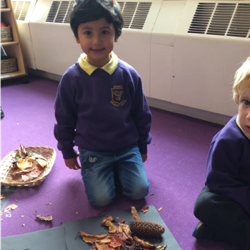 The children used Autumn leaves, conkers and pine cones to create seasonal pictures. 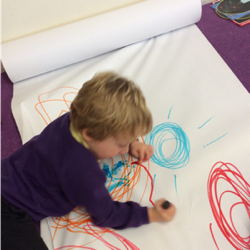 After sharing their experiences of seeing fireworks, some children responded through mark-making. Lots of children have received their first ‘Paw Patrol’ certificate for changing their reading books 5 times. Well done. 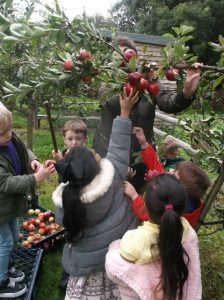 Lots of children were keen to help pick apples from the trees in the orchard. 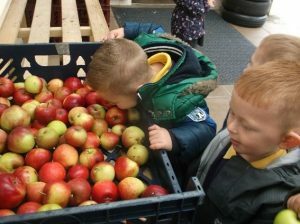 They used them to make apple crumble. 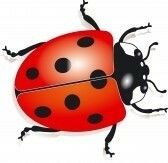 We would like to welcome you and your child to the new school year. We hope that you all had a great summer and are feeling refreshed and ready to enjoy all the exciting activities we have planned this year. 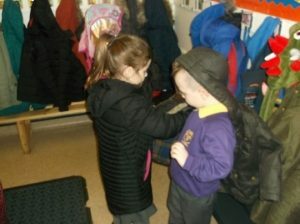 The children are already settling into the Nursery routines and it is lovely to see friendships beginning to develop. 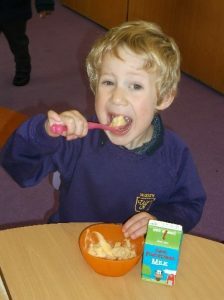 If you have any questions or feel that there is any information that we may require in order to get to know your child more quickly, please do not hesitate to speak to your child’s key worker. In order to help you become familiar with names and faces more quickly, here is a list of the key workers and the group names. Please could you talk to your child about how they have changed since they were a baby. Encourage them to think about the things that they can do now, that they couldn’t do when they were babies. 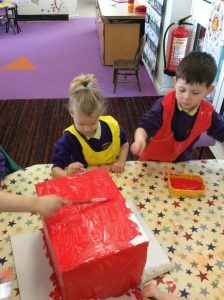 The children are welcome to bring in photos of themselves as babies, to show the class and display on the ‘Wonder Walls’. Are there any brave babies out there who wouldn’t mind being bathed in front of the Nursery children and any even braver parents who wouldn’t mind doing the bathing? (Don’t worry, you won’t have to do any talking). If so, please have a word with Ms Rolston. 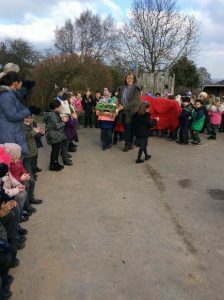 Our topic after the half term break will be ‘What is a Celebration?’, during which the children will have opportunities to share some of the special events celebrated by their own families. 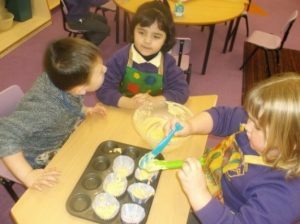 There will be lots of baking and food tasting, music, stories and art work. 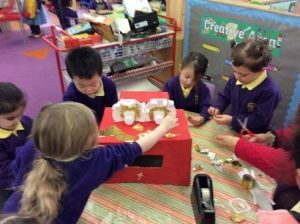 The term will finish with many exciting Christmas activities and celebrations. More details will be given closer to the time.